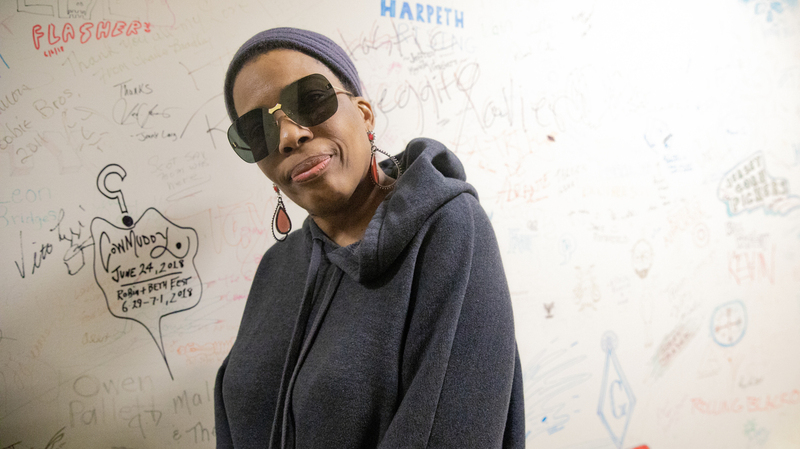 Macy Gray On World Cafe : World Cafe Ruby, Macy Gray's latest album, brings many similarities to her sophomore release, The Id. It's funny and funky, never saccharine, always uplifting. Macy Gray outside the World Cafe Performance Studio at WXPN in Philadelphia. Gray's sophomore album The Id happens to be one of my favorites of all time, and I find many similarities between that album and Ruby, including an honest optimism that is funny and funky, never saccharine but always uplifting. In this session, Gray tells the story of the phone call that changed her life, how she learned to cope with all the fame that followed and her creative output since. Gray shares her very personal reasons for starting a foundation for teenagers with mental health issues, discusses the racial politics of feminism that are portrayed in her fascinating video for "White Man" and performs live with her phenomenal band.